Pickup & Transfer to Houseboat. Afternoon sightseeing of the Mughal Gardens visiting Nishat Bagh built by Asaf Khan, the brother-in-law of Jehangir in 1632 A.D., and Shalimar Bagh built by Jehangir for his wife empress Nur Jahan. All the Gardens are situated on the bank of the Dal Lake with the Zabarwan hills in the background. En route the gardens, visit a carpet weaving factory. Evening Shikara ride on the Dal Lake, visiting floating/ vegetable gardens. Dinner and overnight stay in Deluxe Houseboat/Hotel. 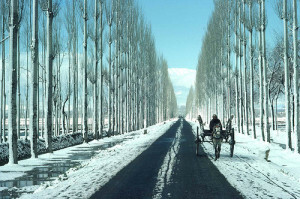 After Breakfast & half day Gulmarg sightseeing. Leave for Srinagar The distance of 56 Kms – 2 Hrs. Reception upon arrival and transfer to Deluxe Houseboat/Hotel. Afternoon sightseeing will include Shankracharya temple in srinagar. Dinner and overnight stay in Deluxe Houseboat/Hotel.